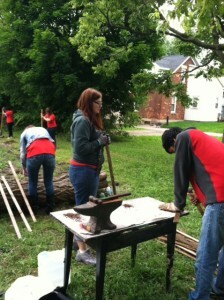 CHC AmeriCorps member, Jess, participates in a service project as part of the 20th anniversary. 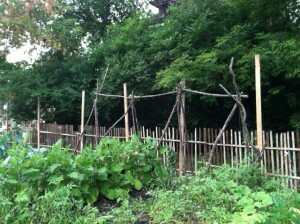 Her team built a fence for a community garden. Last week Friday, some of our AmeriCorps team headed to Lansing to celebrate the 20th anniversary of AmeriCorps with fellow Michigan AmeriCorps members, staff, and alumni. Catherine’s Health Center has had a long-standing relationship with the AmeriCorps program. AmeriCorps members at CHC have a tremendous impact on our patients and greater community. They’ve started walking programs, created healthy cooking classes, developed community gardening programs, helped patients access hundreds of thousands of dollars worth of needed medications, provided one-on-one health coaching, and much more. Needless to say, we’re pleased to be celebrating 20 years of AmeriCorps this year and wish for many more! Final product from the service project. AmeriCorps members Get Things Done.